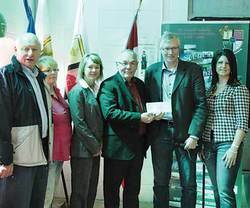 At the Wetaskiwin County Open House, MLAs Dianna McQueen and Verlyn Olson presented cheques to Bruce Banks, the CEO of the 4-H Foundation of Alberta to assist in the participation of Alberta 4-H members in international conferences, one of which will be held in Alberta. The Honourable Dianna McQueen presented a cheque for $10,000 from the Community Initiatives Program to assist the Odyssey 4-H Club from the Fort Saskatchewan area to attend the “Take a Lead Junior Conference” in Tanzania in July. The conference will also have 4-H members from Finland and the U.S.A. attending as well as young people from several African countries. The focus of the conference will be on developing leadership and communication skills with a global perspective but with the intent of making a difference in the local community. The Honourable Verlyn Olson presented a cheque for $40,000 from the Agricultural Initiatives Program to help fund the “4-H International Conference on Sustainable Agriculture” which will be held in Calgary on August 19th to 25th. The conference is presented by Bayre CropScience, and will be attended by 120 delegates from 22 countries. These delegates will include 60 past and present 4-H members from across Canada and 60 delegates from the other countries. The question to be addressed is: What do we need to do to feed nine billion people by the year 2050? Olson mentioned that soon only six countries will be net exporters of food. It is these young, efficient farmers who will develop the high quality means to sustain and increase production to feed the world. Also present at the presentation was Kate Sanford Mitchell, a market research specialist with Bayre CropScience and one of the organizers for the conference.